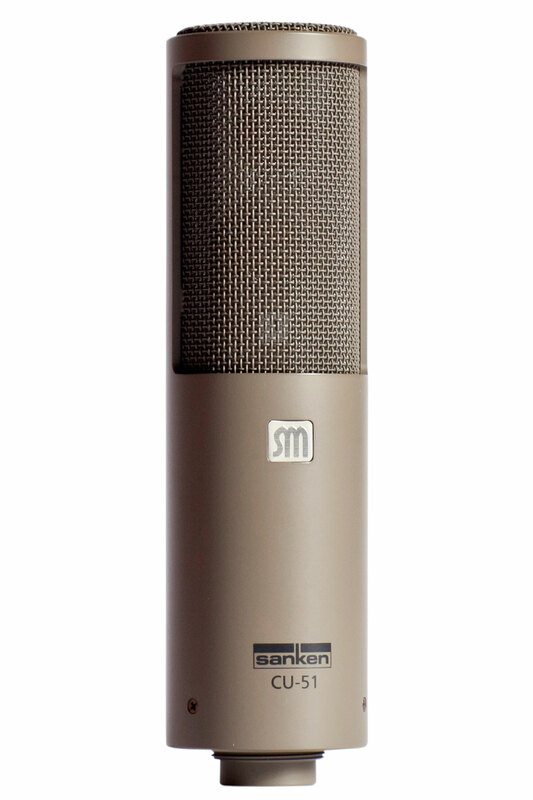 Los Angeles, CA, July 2016 — Sanken, Japan’s first and most original microphone company, has introduced the new CU-51 cardioid condenser microphone as part of the Sanken Chromatic range of professional studio microphones. The CU-51’s unique dual-capsule design provides an exacting cardioid pattern ideal for vocals and a wide range of musical applications. The ability to withstand extremely high SPLs insures clean, distortion-free response when recording instruments with wide dynamics. The mic has a very low proximity effect and makes vocals and instruments seem larger than life. A very special characteristic of the CU-51 is its ability to maintain uniform response in both on-axis and off-axis positions. It is common knowledge that varying the direction of a microphone will change the frequency response and tone. The benefits of larger diaphragms are generally accepted, but previous designs typically exhibit limited high frequency response. Current methods to remedy that limitation also have compromises, including a varying response with the off-axis angle. The CU-51 is primarily a music microphone, unique to Sanken, and addresses the general desire to limit the sonic changes in position to level only. The tone and response of the CU-51 remains consistent through changes in the axis angle while maintaining the benefits of a large capsule design. The CU-51’s specially designed double capsule has one diaphragm that is optimized for low frequencies, while the other one captures the higher frequencies. To achieve this overall wide dynamic response, the capsules are individually positioned within the body of the microphone. The unique capsule mounting arrangement guarantees phase coherency between the two capsules in a meticulously engineered microphone that achieves totally transparent high-resolution results. The PPS (Polyphenylene) membranes are immune to the effects of humidity and temperature change, resulting in consistent response, regardless of the recording environment. The CU-51’s frequency response is truly flat at 90 degrees, essential in maintaining sonic transparency. The microphone consistently delivers a high transient, natural and uncolored sound with vivid sonic imagery. The engineer is given the best possible natural sound for a wide variety of recording applications in music, and is especially suitable for vocals.